Ocean Beach Club, Key Colony Beach A Word of Welcome to Our Florida Keys Resort Ocean Beach Club is a Florida vacation destination that begs to be discovered. 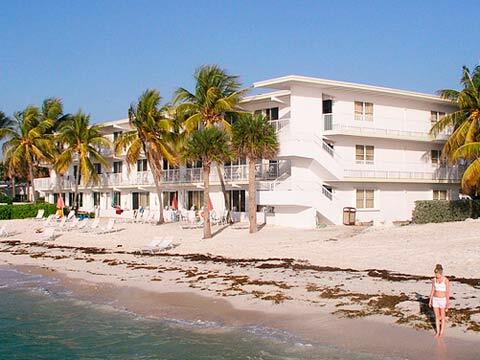 Located on the exclusive island of Key Colony Beach in the Florida Keys, Ocean Beach Club is a boutique hotel reminiscent of tourist lodging in the days before "carbon copy" hospitality chains became prevalent. With all the amenities expected by a seasoned traveler, Ocean Beach Club guests can just relax and feel at home here. The true attraction of our comfortable beach front accommodations is a vacation stay without pretense in a very privileged setting. Ocean Beach Club resort and hotel in the Florida Keys faces south looking out grandly over the Atlantic Ocean. All suites, and most rooms, offer majestic beach front water views providing a virtual picture of sand, surf, and sun, complete with pelicans and gulls. Take a step back and ease into island living. Rediscover the pleasure of walking barefoot on our private white sandy beach. Indulge in the luxury of swimming in our freshwater pool or soaking in our spa - both located on our beautiful Florida Keys beach. All guests enjoy access to our Fishing Pier. Within walking distance, the island offers tiki bars, fine and casual dining, shopping, golfing and all types of water activities. Like a cherished memory - Ocean Beach Club will captivate you. Come visit. Like a hidden secret, Ocean Beach Club hotel and resort in the Florida Keys is here - for you to discover. Hotel Amenities and Features: Private Beach Heated Pool On The Beach Outdoor Jacuzzi On The Beach In Room Spa Services Lobby Shoppe Lending Library Complimentary high speed wireless (WI-FI) internet access Charter Fishing Diving Snorkeling Restaurant Located Directly Next Door Tiki Bar Located Directly Next Door Privileges at Sombrero Country Club -PGA Golf Course, Pro Tennis & Dining Shopping - Boutique, Gift & Clothing Within Walking Distance Fine Dining - Within Walking Distance Parks "Paved" Bicycle and Walking Paths On Site Laundry Ocean Beach Club hotel and resort invites you to our special Florida Keys vacation paradise Ocean Beach Club Resort offers beachfront hotel rooms and suites on the Island of Key Colony Beach in the heart of the Florida Keys. Enjoy beachfront boutique hotel accommodations on our private beach. Each of our 16 suites and most of the 22 guestrooms overlook the Atlantic Ocean, and offer not only spectacular views, but also plentiful amenities for your comfort and enjoyment. Key Colony Beach is located in the Heart of the Florida Keys at mile marker 53.5 on US Highway 1, which is known locally as the Overseas Highway. Referred to as the "Gem of the Florida Keys," the city is situated an island just off Overseas Highway, connected by a short causeway. Content for class "separator" Goes Here History Key Colony Beach was originally known as Shelter Key consisting of 97 acres of low laying island land. There was a sandy beach on the ocean side of this island which is where Ocean Beach Club is located today. Most of the original land forming Shelter Key was marginal, flooding in periods of high tides. In the early 1950â€™s dredges began an around the clock pumping operation which extended the small island north, south and east until it eventually become almost 400 acres. After the fill was solid dredges cut in todayâ€™s existing canals. Heavy cypress timbers were used to construct seawalls to hold back the filled land. Extra material from these canals was then spread over the original fill to elevate the island up to six feet above mean sea level Ocean beach Club started out life as the â€œRuttgers Hotelâ€ and is one of the original business established in the city of Key Colony Beach during itâ€™s inception in the late 50â€™s. Since then Key Colony Beach has developed and grown into the beautiful island location that exists today. A visit to the Ocean Beach Club gives everyone the opportunity to experience this exclusive island retreat and the beauty of the Florida Keys.